For serious rifle competition, you'll be in championship company with MatchKing® bullets. The hollow point boat tail design provides that extra margin of ballistic performance match shooters need to fire at long ranges under adverse conditions. Great bullet for the 300AAC Blackout! Feeds like it should and shoots good groups. What more can be said about Sierra MatchKings. Possibly the #1 competition bullet of all time. The new 7mm long range bullet lives up to its reputation. The bullet also tips very well for even better consistency and a little more BC. I shot the best group of my life with the 7mm 180 SMK; one hole at 300 yards. The 200gr. Sierra HPBT MK is the bullet of choice for my K98 Mausers. They shoot sub MOA at 100 yds if I do my part and the weight works perfectly with the range markings on the sights/scope that the rifle has as stock. I use 48gr Varget in S&B cases to a COL of 80.5mm to get a velocity of approx. 2550fps. The bullets are well balances and do not vary much in weight at all and the boat tail makes stuffing them into the case a snap. I can't say enough good things about the bullet itself, not to mention the support from the manufacturer should you need any. They may not be the cheapest bullet to run through a rifle, but ya would be hard pressed to find a better one. I like this bullet so much I literally built my rifle to shoot it. Will remain supersonic from a 22" barrel at 1000 yards fired from a .308. Just make sure you have a fast enough twist. Easy to find a great load with. Very accurate. Very consistent. Quality is superb. I keep trying to convince myself to try Bergers, but the Match King are so good, I feel no need to change, and they are $15 less per hundred! I use matchking for all my precision loads. They simply work.no they aren't a CUSTOM bullet but you would have to be a competitor to appreciate the minimal increase in accuracy with an added big cost. I shoot this bullet in two different 7mm chamberings (7mm WSM and .280 Rem). It is very easy to get shooting becasue as with all Sierra bullets it is not very sensitive to bullet jump. I jump mine 0.010" off the lands and they shoot very well. I've shot them for three years now and have not noticed any lot ot lot variences and they are dimensionally uniform. In a test with the Berger Hybrids they shots just as well and when you factor in the price difference they are the way to go for me. The 7mm 175 SMK is an outstanding long-range target bullet. I use it in my .284 out to 1,000 yards and it performs well. H4831sc produces 1/2 MOA accuracy and the bullet really cuts through the wind. If you shoot 260 Rem and you want one bullet to shoot all the way across the course then the 123gr SMK is the bullet to shoot. As is the case with all Sierra bullets it is extremely easy to get shooting quick due to its relative insensitivity to jump. Ballsitically this bullet is supperior to the 107gr or 120gr SMK and out to 600yds it will shoot right with the 142gr SMK in wind drift if you look at the numbers. This bullet is a dream in rapids as it takes that sudden wind chagne you get mid string allot better than some others. I have shot this bullet it many XTC matches and MR matches and the points I've dropped have never been the fault of the bullet. Some of the most accurate bullets I've ever shot out of my Rem. 700 .308. The .310 Sierra 174gr HPBT MK is simply an awesome bullet. Yes they are not the cheapest bullet you can buy, but you would be hard pressed to find a better one. I have worked up loads for my Mosin Nagant 91/30 (1932) with these bullets for myself and my friends and have had great success with Varget and H380 powders. We are getting 2570fps with 50gr of H380 with a COL of 75mm on a PPU case. With this load we are getting MOA groups (@ 100 yds.) out of number of different M-N 91/30's, all with bores in varying states of condition and diameters (common on old Russian built military rifles from WW2). To sum it up, I think the best endorsement came from our local dealer who told me when I was starting to get into loading that "sooner or later everybody reaches for the green box." I did and I will continue to reach for that green box for a long time to come. We use SMK's for most of our long range target shooting, and this bullet is no exception. Sub-moa from my 91/30, I shoot it at 600 yards over 43.5 grains of Varget. I like to shoot competitively and this bullet has beaten every bullet I've tried in this weight class.I hope others get this kind of performance also. I love this bullet! To be more precise, my 300BLK AR seems to really love this bullet. I've tried several, mostly in lighter weights, and get a lot of variance in point of impact from 50 to 100 yards. With this bullet I'm finding that the rifle shoots pretty much to point of aim at both distances and very, very accurately. Legalese disclaimer: Your milage may vary but please don't flame me. I can only report my experience. Not sure if there are competitive bullet weight restrictions but it seems like this bullet would be good for competition, self defense, hunting and good old target practice. I just wish Sierra could make them fast enough for Brownells to keep in stock. My shooting and re-loading are done with the highest degree of precision I can manage. After shooting virtually every type of match bullet available without the results I expected, I finally decided to try the 155 gr. Palma Matchking. My third consecutive 5-shot group of the day, done at 100 yards...yes, with witnesses, resulted in a personal best of .126 inches. Now that's what I've been looking for. All I can say is WOW! I prefer the 175gr SMK but you need a 1:10" twist for that round. If your barrel is 1:12" then this round is tops, period. These bullets remain stable at 850 yds without a lot of work. I am right at the transonic point, yet I have yet to see a keyhole. Very good product without a doubt. 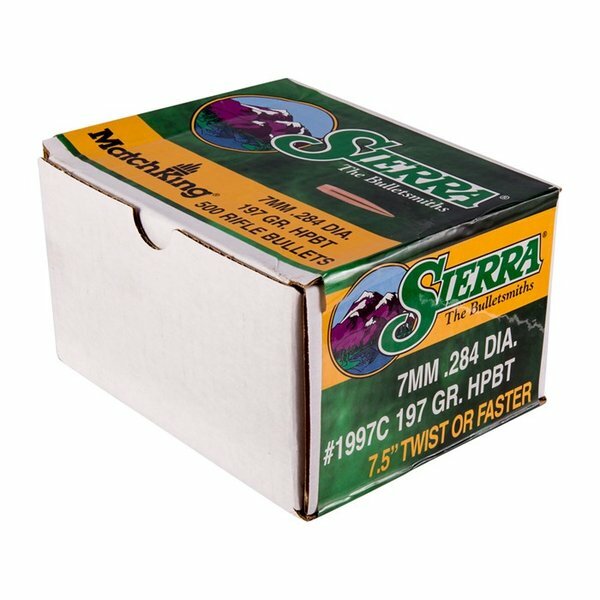 Use This Sierra In My Reloads For My M1 Garand. Loaded With 46.5gr IMR4064.More Accurate Than I Can Shoot It. Any bullet that can hold a .36" five shot group at 100 yards is a great bullet. Picked these up to compare to the Amax in my .260. Sorry Hornady, but you have some competition here. It's hard to trump 2 holes for 4 shots, but I like the smk profile better, and had better luck past 400 with them. I'll keep a stock of both, but Sierra just took the primary shelf. I have been using this bullet for deer hunting since back in the early 1980's. I like taking head and neck shots with bullet; it is very accurate. My longest and biggest deer kill shot was 375 yards at a 300 lbs 8-point buck; the ran off about 40 yards and dropped dead. It was a frontal chest shot and the heart was completely destroyed by the bullet. federal match primers, Hodgon CFE223 powder. 25.5 gr of powder. Bushmaster 20" barrel AR. you are going to get 1" groups at 200YDS all day long. Easy to find CBTO for this bullet. Consistently shoots less than .25 groups in my Savage 12 FCV .223 Rem. with a 9 twist stock barrel. These are amazing and very consistent. 69g with 23.8g IMR 4895; 1.750 case length and 2.235 yields a avg of .4MOA (5shots) @ 100yds out of my 24" SS BullBarrel. Best group was a .311 moa. I used this bullet for myself and also worked up a load for a friend who was the sniper for his PD Team. He shot it out of his Remington 700BDL and 5 shots one hole you could cover with a dime at 200 yards day in day out. The new loading books have the powder load down from what we loaded his at in the late 70's do not know why but thats the way it is. Speer's Manual#41 calls a max load of 26.5gr of H335 we loaded 26.6gr of H335 and I am sure we followed the book and did not use a max load. But 26.4gr. gave almost the same results. This was off of a bench and sand bags not free hand. Will shoot nothing else out of any of my .223 Rifles. I use it in my Ruger Mini-14. I bought my wife a Howa 223 Varminter because as new empty nesters she wanted to see why I had so much fun reloading during the week and shooting on the weekend. I bought her the Howa on the recommendation of a local gunsmith, bought 8 types of bullets and luckily only needed to pick up one type of powder, the others already in stock at home. I cannot make that Howa shoot 5 shot groups over an inch. Even bullet/powder combinations it does not like (anything Nosler CT), but load these little 52gr HPBTM over just about any WIN 748 weight and they seem almost magical. When she pays attention she'll shoot 5 shot groups in the low .2s and .3s. Had two targets in the teens. I've never bought a 500 pack of jacketed bullets before. This is my second box. She wants to shot her first informal benchrest match next month. With these 52gr Sierra HPBTM bullets she should shoot very respectfully. BTW, The Howa is stock except for a bit of trigger work and I mounted a 6-24 Bushnell AO on it. Very accurate bullet 3/8 inch. Good on crows ect. loading it for 223 next. I am ready to try on coyotes next. Also use 65 gr. Sierra for deer and hogs and 69 gr. for deer and coyotes. I generally use varget and h-4895 and get sub M.O.A. if I do my part. have used these since 1970 in my Remington 700 BDL in .222 Rem Mag. wouldn't use anything else although brass is hard to come by these days if not impossible. Use this for target shooting in a WOA service rifle. 4 round group, three in the same hole, could cover group with a Dime / 100yrds, Most accurate bullets I have found. You must have chamfered cases due to no boat tail to avoid galling. I was turned on to this bullet. By a Team Leader. At 500 yards. Into a plastic 30 gallen barrel full of water. It goes all the way through the front side. Short swim. And sticks itself into the backside of the barrel. Oh ! Did I forget to mention. How flat this Bullet flies. 300 Win Mag. 26" med Bull barrel. I have a 1895 7mm Chilian Mauser. I have tried several different bullets/loads, nothing to earth shattering. I just got through benching at 50 yards, 5 rounds of Sierra 150 gn HPBT. I used Varget powder, 46.4 grains. You can cover the five shot group with a quarter. Outstanding. And not too shabby for a rifle over 100 years old. I will continue to use these bullets in my 7mm and will start working up loads for all my other rifles. Valmistajan tuotenumero: 1997C 092763519974 Meiltä saat SIERRA MATCHKING luodit jälleenlataamiseen. Saatavilla useita eri luotityppejä, kaliipereja sekä painoja. Vakava kiikarikiväärin kilpailu sinulta championship seurassa MatchKing® luoteja. Ontto kohta boat tail suunnittelu tarjoaa että ylimääräistä liikkumavaraa ballistisella ottelu ampujan tulipalo pitkillä etäisyyksillä epäedullisissa olosuhteissa. Valmistajan tuotenumero: 2415 092763024157 Meiltä saat SIERRA MATCHKING luodit jälleenlataamiseen. Saatavilla useita eri luotityppejä, kaliipereja sekä painoja. Vakava kiikarikiväärin kilpailu sinulta championship seurassa MatchKing® luoteja. Ontto kohta boat tail suunnittelu tarjoaa että ylimääräistä liikkumavaraa ballistisella ottelu ampujan tulipalo pitkillä etäisyyksillä epäedullisissa olosuhteissa. Valmistajan tuotenumero: 2121 092763021217 Meiltä saat SIERRA MATCHKING luodit jälleenlataamiseen. Saatavilla useita eri luotityppejä, kaliipereja sekä painoja. Vakava kiikarikiväärin kilpailu sinulta championship seurassa MatchKing® luoteja. Ontto kohta boat tail suunnittelu tarjoaa että ylimääräistä liikkumavaraa ballistisella ottelu ampujan tulipalo pitkillä etäisyyksillä epäedullisissa olosuhteissa. Valmistajan tuotenumero: 2121C 092763521212 Meiltä saat SIERRA MATCHKING luodit jälleenlataamiseen. Saatavilla useita eri luotityppejä, kaliipereja sekä painoja. Vakava kiikarikiväärin kilpailu sinulta championship seurassa MatchKing® luoteja. Ontto kohta boat tail suunnittelu tarjoaa että ylimääräistä liikkumavaraa ballistisella ottelu ampujan tulipalo pitkillä etäisyyksillä epäedullisissa olosuhteissa. Valmistajan tuotenumero: 9350T 092763393505 Meiltä saat SIERRA MATCHKING luodit jälleenlataamiseen. Saatavilla useita eri luotityppejä, kaliipereja sekä painoja. Vakava kiikarikiväärin kilpailu sinulta championship seurassa MatchKing® luoteja. Ontto kohta boat tail suunnittelu tarjoaa että ylimääräistä liikkumavaraa ballistisella ottelu ampujan tulipalo pitkillä etäisyyksillä epäedullisissa olosuhteissa. Valmistajan tuotenumero: 1575 092763015759 Meiltä saat SIERRA MATCHKING luodit jälleenlataamiseen. Saatavilla useita eri luotityppejä, kaliipereja sekä painoja. Vakava kiikarikiväärin kilpailu sinulta championship seurassa MatchKing® luoteja. Ontto kohta boat tail suunnittelu tarjoaa että ylimääräistä liikkumavaraa ballistisella ottelu ampujan tulipalo pitkillä etäisyyksillä epäedullisissa olosuhteissa. Valmistajan tuotenumero: 1575C 092763515754 Meiltä saat SIERRA MATCHKING luodit jälleenlataamiseen. Saatavilla useita eri luotityppejä, kaliipereja sekä painoja. Vakava kiikarikiväärin kilpailu sinulta championship seurassa MatchKing® luoteja. Ontto kohta boat tail suunnittelu tarjoaa että ylimääräistä liikkumavaraa ballistisella ottelu ampujan tulipalo pitkillä etäisyyksillä epäedullisissa olosuhteissa. Valmistajan tuotenumero: 1997 092763019979 Meiltä saat SIERRA MATCHKING luodit jälleenlataamiseen. Saatavilla useita eri luotityppejä, kaliipereja sekä painoja. Vakava kiikarikiväärin kilpailu sinulta championship seurassa MatchKing® luoteja. Ontto kohta boat tail suunnittelu tarjoaa että ylimääräistä liikkumavaraa ballistisella ottelu ampujan tulipalo pitkillä etäisyyksillä epäedullisissa olosuhteissa.